Giant Manta Rays: Ocean Drifters or High Seas Homebodies? For giant manta rays in the Indo-Pacific, home means a surprisingly small spot in the ocean. Sometimes called ‘pandas of the sea’, these gregarious, toothless, and more than 4,000-pound sea creatures call warm saltwaters across the globe home. Until this week, most experts also thought that, much like other large ocean filter-feeders, they travel far and wide each year to make epic, thousands-of-miles migrations. “It wasn’t until we started tagging mantas and getting data that we realized this isn’t the case,” says Joshua Stewart, currently a PhD candidate in the Scripps Gulf of California Marine Program. He’s lead author on a new study in Biological Conservation that suggests some giant manta rays travel less than previously thought. In fact, they didn’t journey far at all. Slipping into the ocean with the gentle beasts, Stewart’s team tagged and satellite-tracked rays from three spots in Indonesia and Mexico over two years. They found that the rays didn’t swim more than about 150 miles from where they were first tagged. Compared to a whale shark’s 5000-mile swim or baleen whales that travel from the polar zones, almost all the way to the equator each year, the finding is a surprise. Giant rays certainly have robust enough bodies to endure the distance, Stewart says — they’re just not doing it. To figure out the size of the rays’ range, tags attached to the body were paired with data on DNA and diet. By sampling their muscle tissues for “stable isotopes,” the atoms of carbon and nitrogen that exist in all living things and move down through the food chain, Stewart saw that each manta ate a diet specific to their region. “I could pluck out one of your hairs and essentially figure out the same thing for you,” he says. 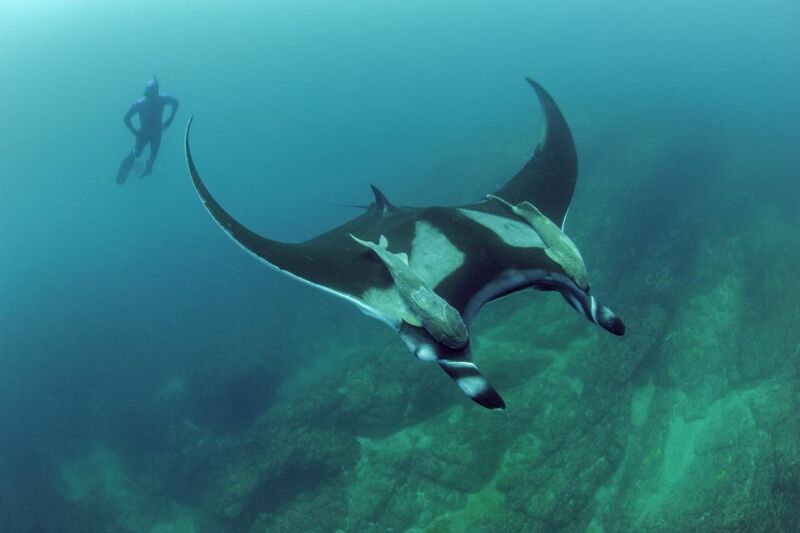 Mantas near the Mexican coast, for example, eat inner-coastal plankton. The same was true for those found in eastern versus western regions of the Pacific. Stewart still isn’t sure why these rays travel less than their other filter-feeding relatives like baleen whales and whale sharks, which migrate to follow the flux of seasonal food. “Perhaps rays are competing for the same resources, which are in high demand because it’s an El Nino year,” he says. In May, Stewart published a study in Zoology suggesting that rays change their diving patterns seasonally to increase access to a range of foods. He believes this allows mantas to target different types of prey locally, while some of their close cousins are forced to migrate when food gets scarce. The small home range Stewart discovered could be specific to the 18 rays from which his team recovered data, not necessarily the species as a whole. “Our satellite tagging studies are actually saying the opposite of this study,” says Marine Megafauna Foundation founder Andrea Marshall, who tags giant manta rays as the travel between South Africa and Mozambique. At least 50 percent of giant mantas in oceans across the world, she says, make international migrations every year. Stewart suggests at least some of these movements are occasional long distance travels rather than true migrations. He points to an example in Marshall’s own data near Ecuador and Peru, of a ray traveling to the Galapagos. “International” is also tough to define, as the animals regularly cross nearby boundaries. Regardless, some of these giants are certainly residential and added attention should be given to local protection efforts, says Stewart. Top-down, intercountry protections are needed given that marine animals don’t respect national lines. “But we also know that local communities that deal with these issues on a very personal scale tend to be more effective at managing their resources than an overarching entity,” he says. Correction: This article originally stated that Joshua Stewart’s data showed a manta ray visiting the Galapagos Islands, when in fact the data came from Andrea Marshall. Becca Cudmore is a journalist from Oregon. Her work has appeared in Audubon, The Scientist, Scientific American ​a​nd elsewhere .